Heat-related illnesses can come on gradually in stages. 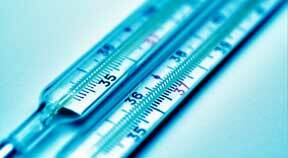 Hyperthermia occurs when the body is unable to cool itself. Summer is the time for fun in the sun, but it’s also when we have to be careful in hot and humid weather. Extreme heat can make us sick not only when we are out overexerting ourselves, but also when we are doing little activity or even just sitting still. Heat-related illnesses strike when the body is unable to regulate its temperature and cannot properly cool itself by sweating. Heat can be deadly. From 1999 to 2003, more than 3,400 deaths resulted from exposure to extreme heat, according to the Centers for Disease Control and Prevention. For 65% of these deaths, exposure to excessive heat was the underlying cause, while hyperthermia was recorded as a contributing factor for the remaining 35%. If you see your children getting flush while out playing, stop the activity and cool them off. Heat syncope — A fainting episode of dizziness that usually happens during activities in a hot environment. Dehydration and a lack of acclimatization are factors that might contribute to heat syncope. Symptoms include light-headedness, dizziness, and fainting. Heat cramps — Cramps that affect people who sweat a lot during strenuous activities. The low salt levels as a result of sweating cause the painful muscle cramps. Symptoms include muscle pain or spasms usually in the hands, arms, legs, and abdomen. DuBois recommends seeking medical attention if the person has heart problems, is on a low-sodium diet, or if the cramps do not subside within an hour. Heat edema (swelling) — Usually occurs when an unacclimated person is exposed to hot weather. Symptoms include profuse sweating, extreme redness in the face, and swelling in the hands, lower legs, and feet. Heat exhaustion — The body’s response to loss of water and sweat, usually through excessive sweating. Symptoms include heavy sweating, extreme weakness and fatigue, dizziness, and clammy skin. Heat stroke — A medical emergency; body temperature is over 104 degrees orally. Symptoms include confusion and dizziness, hallucinations, throbbing headaches, and chills. Heat stroke can cause death or permanent disability if emergency medical treatment is not given. DuBois says cooling the body down quickly is an important first step in treating heat-related illnesses. This means first moving the victim to a cool, shaded area. Further treatment can vary depending on the illness; for example, drinking cool water is recommended for treating heat syncope, cramps, edema, and exhaustion, but not recommended for heat stroke. Although anyone can suffer from a heat-related illness, young children, older adults, and people with chronic medical conditions are especially at risk. She adds that parents and caretakers must limit their children’s activities on hot days and stay on the alert for any symptoms of heat sickness. “If you see your children getting flush while out playing, stop the activity and cool them off,” DuBois advises. Heat combined with humidity can make for a particularly hazardous situation because humidity slows down the body’s ability to evaporate sweat. Drink plenty of non-alcoholic and caffeine-free fluids; drink two to four cups of cool fluids an hour if active. Wear light clothing that allows evaporation and heat dissipation. DuBois recommends cool-down clothing that wicks away moisture to keep the body cool and dry in warm conditions, especially for people who are active. Stay cool indoors also; use air conditioning and/or electric fans to help circulate the coolness. Schedule outdoor activities during the coolest time of day. “If possible, don’t schedule from 11 a.m. to 4 p.m. when it is hottest,” DuBois says. Use the buddy system – don’t do anything strenuous alone in the heat. The information in this article is provided for general information purposes and should not be relied on as a substitute for actual professional medical advice, care, or treatment. You are encouraged to consult with your physician or healthcare provider to obtain professional medical advice.